Screener attachments for skid steers and other small carrier machines have seen an uptick in popularity in recent years, due to their versatility and ability to increase onsite efficiency. In terms of their own versatility, these attachments are ideal for applications such as composting, aerating, topsoil mixing, pipeline padding and more. In terms of versatility for the carrier machine, these attachments also increase fleet utilization because they quickly couple and uncouple for use onsite. Screening buckets for compact equipment run the gamut of vibrating-style, trommel-style, flip/rotating-style and screener crusher-style — the latter of which, as exemplified by the ALLU Transformer, can provide both screening and crushing/shredding functions for the operator. The screener crusher bucket can be designed specifically for use with mini excavators, small wheel loaders, backhoes and skid steers. They comprise a bucket-style frame, with two spinning drums inside the frame at the base of the bucket. The drum design, with appropriate blade style and positioning, determines the material flow and the screening, crushing and shredding action. A two-way hydraulic system, connected to the carrier machine’s own hydraulics, allows the drums to rotate in an upward direction (toward the back of the bucket) or in a downward direction. As the drums rotate upward (see Figure A), the shape of the upper frame enables material to begin circulating inside the bucket, allowing smaller material to escape between the blades and out the bottom of the bucket for efficient separation of different fragment sizes. By reversing the drum rotation direction to a downward rotation (Figure B), the lower frame guides the material toward the gap between the lowest drum and the bottom of the bucket, creating a crushing effect. In addition to drum rotation, material movement varies by the type of material, as well as the blade configuration. The attachment is a two-way hydraulic auxiliary circuit, and it requires both rotation directions for best performance. The attachment couples to the carrier machine using a quick-attach mount plate and quick-attach hydraulic lines. Once mounted, it is ready to run. The operator runs the attachment from inside the skid steer or compact base machine. In fact, contractors often refer to these attachments as “plug-and-play” portable screeners and/or crushers because they simply attach to the bucket and start processing. The screener crusher bucket is ideal for increasing efficiency in landscaping, agricultural and construction applications. 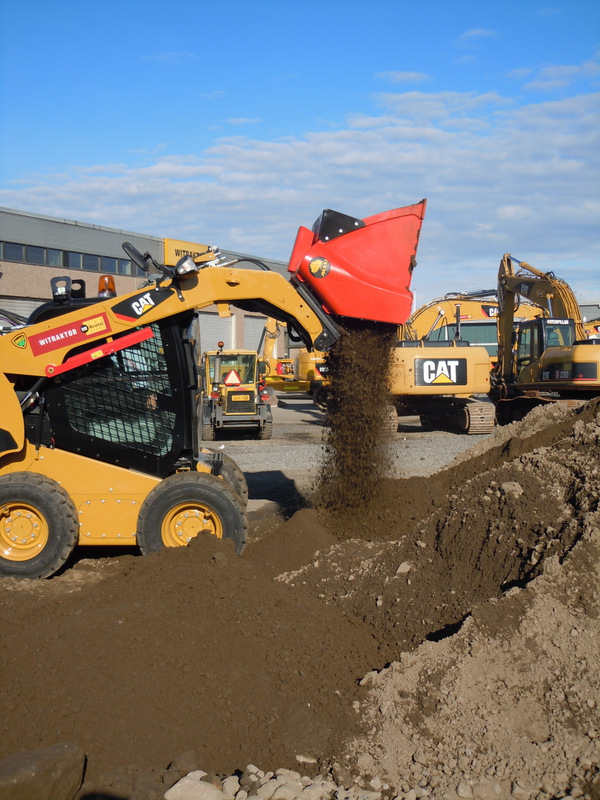 From composting to aerating, to top soil and peat screening, to waste and debris processing, all work can be handled onsite because the attachment processes and loads the material in one stage. Certain units for compact machines are also ideal for padding and backfilling on smaller cable and pipeline jobsites, because they allow material to be screened onsite and then backfilled directly into the trench, eliminating the need for dedicated stationary screening or the purchase of fine soil. The basis of the ALLU’s DL is a unique top screen, where the screening blades spin between the top screen combs. The end material size is defined by the space between the combs. These screening combs carry most of the material weight to ensure the attachment’s drums and bearings experience less impact and load. The construction is clog-free and maintains good capacity, even with wet materials. A single attachment allows the contractor to change screen sizes, ranging from 5/8 to 1-1/4 to 2 in., just by changing out the screen and hammers. The screening blades and top screen comb are changeable when worn or when changing size adjustments, which also helps to keep operating costs low. The attachment’s maintenance program primarily consists of daily and weekly inspections and weekly and annual servicing. As part of the daily and weekly inspection procedures, the operator should check the condition of the frame, wear parts and power transmission and remove any stones or other hard fragments caught in the blades. During weekly servicing, the power transmission’s lubrication should be changed or the lubricants topped up. These attachments have no-grease bearings, which contribute to their easy maintenance schedules. Because the wear to the blades, drums and bearings depends on the operating conditions and the material processed, wear part replacement does not follow a set schedule. The components that are most likely to experience wear, however, are the blades and counter blades. The operator should check these components for wear in connection with each weekly inspection and replace the parts before they become worn to such an extent that continued operation wears the holding structures for the blades and drums or other structural components. 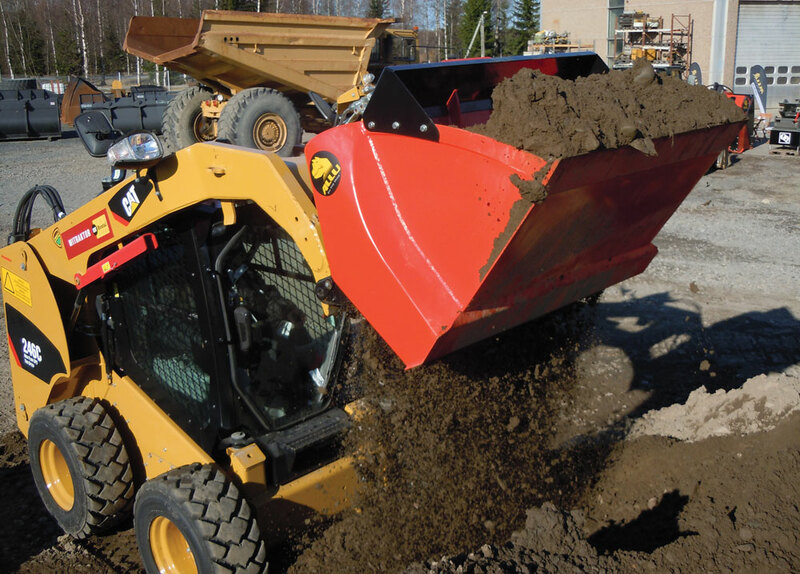 Considering a skid steer base as the machine, screener crusher buckets are available in a variety of model sizes, often ranging from 4,400 to 17,600 lbs in weight. The hydraulic flow, in gallons per minute (gpm), converts to the rotating drums’ revolutions per minute (rpm). A correctly set flow provides the best capacity and minimizes wear. On a skid steer, these attachments require a low flow of 8 to 18 gpm at 3,000 maximum psi (which converts to the drums’ torque). A correctly set maximum pressure provides easy start and reverse operation of the drums. Screener crusher buckets are popular with rental companies because they allow the companies to increase their fleet utilization — as they rent out two machines at once: the carrier and the attachment. For contractors, the decision to purchase or rent a material processing attachment typically involves a consideration of the cost of purchasing or renting a portable screen and/or crusher and all of the associated costs with operating the machines onsite. These costs include transporting the crushing and screening plant(s) to the jobsite, their operating cost, the transportation and operating cost for a loader of some sort (e.g. a skid steer) and the cost of conveying or moving and loading the material away from the processing machine(s). Alternatively, if the contractor rents or purchases a screener crusher bucket, it will quick-attach to the skid steer, it is transportable on the base machine and it accomplishes screening/crushing and loading the material in one step — with one operator and one machine. As previously mentioned, the ALLU Transformer attachments for skid steers are available in three model sizes — narrow, medium-width and wide. MSRP ranges from $17,000 to $26,000, plus mounting plate, hydraulic jumper hoses and shipping. The narrow attachment is primarily used with mini excavators, but all three sizes will fit a skid steer. Each of these three sizes is available with three optional screening choices or three optional crushing sizes — 15, 25 and 50 mm — using axe blades for crushing or standard blades for screening. The wear hammers are easily changeable and replaceable. Dale Mickle is vice president of sales and marketing for ALLU Group Inc.